The youngest couple on The Block, Josh & Elyse, scored 10/10 for their contemporary take on a traditional Hampton style kitchen. 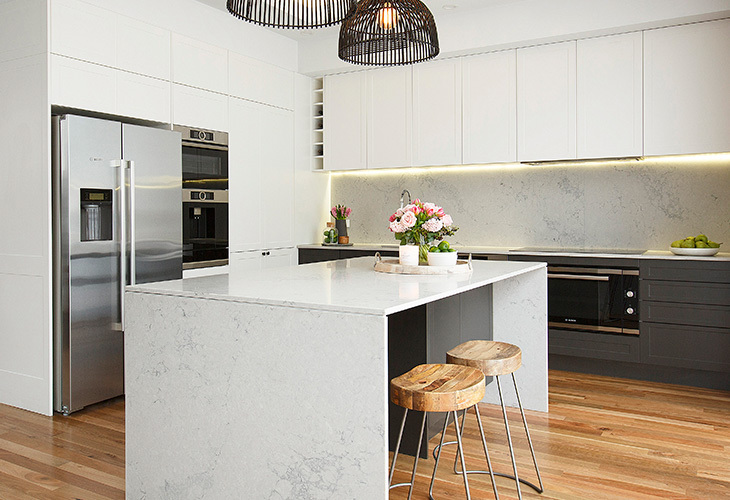 They opted for ‘Sierra Cinder’ and ‘White’ profiled cabinetry from Freedom Kitchens to align with the look of the rest of the house, and centred their kitchen space with a luxe Caesarstone island benchtop with waterfall ends, in ‘Noble Grey’. In a risky move that paid off, their island bench was the only one oriented to face the garden rather than the living area, to enhance the feel of indoor-outdoor living. Another winning feature was their enormous hidden butler’s pantry, perfect for hiding away mess. This kitchen also features beautiful Bosch appliances fit for a large family, including a freestanding side-by-side stainless steel fridge, 900mm gas cooktop and integrated coffee machine.